Twelve years after a major golf course renovation by Golf Course Architect Lester George, the Country Club of Florida is again teaming up with George Golf Design for a practice facility upgrade. The new practice facility will include an expanded driving range, short game practice facility, and teaching facility. The practice facility upgrade is scheduled to coincide with greens renovation and regressing. The club also has future plans to reconstruct their bunkers with a modern liner system. “This project is a way to make a great facility even better! What we’re planning could arguably be the most forward-thinking practice facility in the design game. We’re taking this to world-class level,” said Director of Golf Chris Kushner. “Lester designed our golf course with the versatility that allows it to be played by all of our members for their entire lives,” said Kushner. Since the initial renovation, Lester has visited the course on annual basis, acting as the club’s ongoing design consultant for everything from course landscaping to tree removal to course modifications and mowing patterns. The Country Club of Florida was founded by Chicago native Carlton Blunt, who was a member of Augusta National Golf Club. Designed by Robert Bruce Harris in 1955, and opened in 1957, the secluded spot near Boynton Beach was deemed the best possible site on which to build a golf course with all the features a national member could possibly want. Harris looked at 60 to 70 sites in south Florida discovering this site. He was taken by the unique topography that has a ridge running through the property at the highest elevation in south Palm Beach County. The Country Club of Florida is said to have been Harris’ favorite design of his more than 160 works. He retired and spent the last years of his life there. 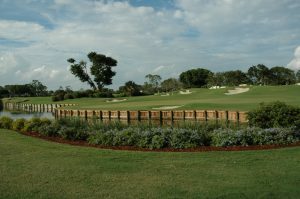 “Because of its extremely private nature, the Country Club of Florida was somewhat unknown prior to the 2006 renovation. Harris’ original classic design strategies had been diluted over time. 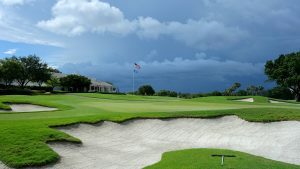 The redesign helped shine a light on this hidden historic gem and elevate the Country Club of Florida into the top 200 classic golf courses in the country,” said George. The Country Club of Florida is currently ranked #137. “We will have a comprehensive short game area, a climate-controlled building for swing analysis, and a contoured area for landing. Lester has shown us a lot of options,” said Kushner. “Thankfully, we have something to work with that a lot of clubs don’t have, which is land. “We have enjoyed working with Lester so much, and we are really excited about working with the George Golf Design team on the renovation of the greens, bunkers, and practice facility. We can’t think of anybody we’d rather have working with us.” said Kannapell. About Lester George: A member of the esteemed American Society of Golf Course Architects, internationally renowned golf course architect, Lester George, has quite a versatile resume. In addition to his award-winning new course designs, has developed a niche in renovating and restoring classic golf courses designed by some of the most revered golden age architects. He has worked on everything from plains to steep, rocky terrain to brownfield and environmentally challenging sites, including a course under which thousands of unexploded bombs were discovered once excavation began – and he has become somewhat of a master at designing practice facilities that offer a realistic experience for golfers. George’s Kinloch Golf Club is the highest ranked golf course in the history of Virginia, having won countless awards. Ballyhack Golf Club is rated # 7 in the state by Golf Digest and was on several top ten Best New Course lists. The Old White Course at The Greenbrier was honored as Golf Digest’s Best New Remodel and now hosts a PGA Tour event; the James River Course at The Country Club of Virginia was the #5 Best New Remodel; Willow Oaks Country Club was one of Golf Digests’ Best New Remodels of 2009; and Lester’s renovation of Independence Golf Club was listed as one of Golf Digest’s Top 10 Best Remodels of 2015.